Shouts of “Daulat Tuanku” rang out along with “Huat ah! Heng ah!” when the Johor Chingay street parade marched past the grandstand where the Sultan of Johor, Sultan Ibrahim Sultan Iskandar, viewed the annual tradition of the Johor Gu Miao last night. Flanked by Menteri Besar Johor, Datuk Mohamed Khalid Nordin, Johor executive councilor, Datuk Tee Siew Kiong and Johor Baru Tiong Hua Association chairman, Datuk Seri Tey Kim Chai, the Johor Sultan beat a drum to launch the Johor Chingay parade. Tey thanked the Johor ruler for gracing this year’s street parade as his presence was significant to the Chinese community. Tey also echoed the sultan’s previous calls for Bangsa Johor to unite and continue to work together for the success of the state. He said the annual tradition of the Johor Chingay was making an impact globally, particularly to China, a nation which lost most of its cultural heritage after the Cultural Revolution. Although the Johor Sultan witnessed the Johor Chingay street parade in 2006 while he was the Crown Prince, this was the first time he had attended as the as the Johor ruler. A souvenir book on the history of this annual tradition of the Johor Gu Miao or Johor Old Temple, published by the JB Tiong Hua Association was presented to the Johor ruler by Tey. Festival organizer, the JB Tiong Hua Association for the Johor Old Temple, has continued with this annual tradition since the 19th century without interruption except once during the Japanese invasion in 1942. While the festival originated as a religious tradition where the temple deities are taken on an annual “tour” to bless the city with peace and harmony, good weather for the cultivation of gambier and to celebrate good harvests, it has evolved into a cultural carnival and award-winning tourist attraction. While waiting for the street parade to reach the grandstand on Jalan Wong Ah Fook, the sultan and other guests enjoyed cultural dance performances and a skillful display by the award-winning dragon dance troop from Jalan Yahya Awal. Roads in the city were closed for dragon dancers, lion dancers, stilt-walkers and giant flag bearers who showed off their skills while some 40,000 participants and spectators admired the gaily decorated floats that featured the legendary monkey king. The celebration which started five days ago with a lighting ceremony at Xing Gong, a temporary shrine at Jalan Ulu Ayer Molek, and peaked with the street parade last night, ends today when the deities are returned to the temple after their annual outing. Chingay Kuil Kuno Johor, a limited edition souvenir book on the history of this annual tradition of the Johor Gu Miao, was published to commemorate this year’s Johor Chingay festival. An editorial board assembled by the Johor Baru Tiong Hua Association worked hard to collate relevant information and a selection of photos to publish just 2000 copies of the souvenir book. Published in three languages – English, Malay and Chinese – copies of this book are available from the JB Tiong Hua Association as well as the Hokkien, Hakka, Hainan, Cantonese and Teochew associations from today, February 28. “This publication is distributed free-of-charge but freewill cash donations are welcome,” said JB Tiong Hua Association chairman, Datuk Seri Tey Kim Chai, who was also advisor to the editorial team for the publication. He said cash donations will go to the Johor Gu Miao Foundation, a charity of the Johor Old Temple founded by Yap Yeen Min, the book’s chief editor. Yap was recognised in last year’s Iskandar Malaysia Social Hero Awards for his contributions to social work. Tey said that while the charity, which started some 10 years, has helped more than 360 families, they also welcome applicants from the multi-racial community who need support. The montage of cover photos on the souvenir book were by Kenny Seah and Tang King Huat while information research was contributed by the sub-committee of the Johor Old Temple or Kuil Kuno Johor and the Johor Baru Chinese Heritage Museum. The layout design was by the team at Interesthink Sdn Bhd and members of the editorial team include Su King Siang, Lew Kee Keong (KK), Tony Wong Kok Poh, Shirley Lee, Yee Tuck Wee and Irene Chen Yeok Choo. I had the privilege to contribute the English copy which was translated into Malay and Chinese by Jassmine Shadiqe and Mok Whui Ying, respectively. 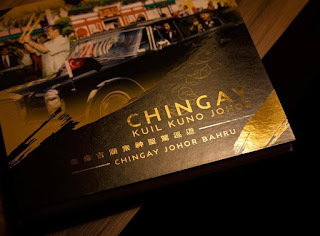 Only 100 hardcover copies were published to present to royal guest-of-honour, the Sultan of Johor and other special guests at the Johor Chingay tonight. 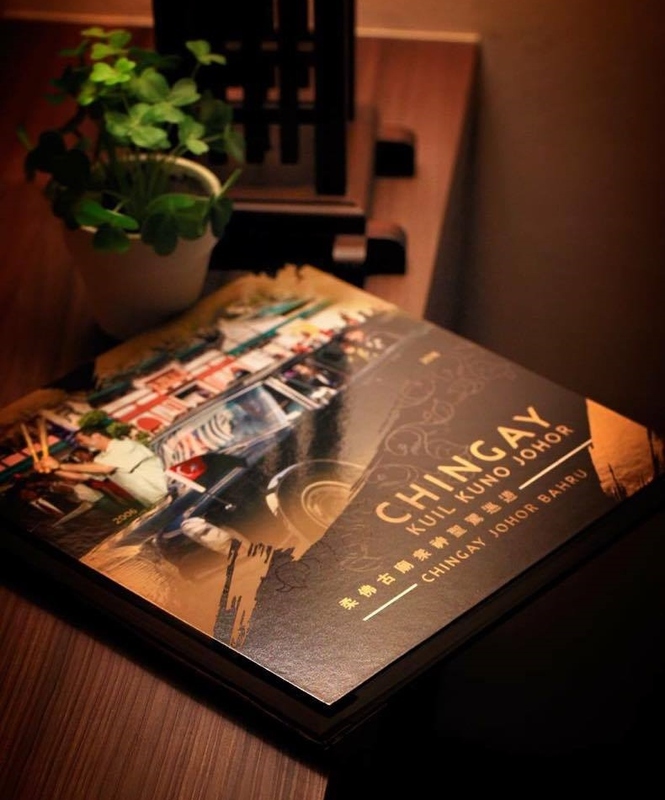 “In addition to this souvenir book, the JB Tiong Hua Association also invites viewers to enjoy this year’s Chingay parade through live streaming telecast on http://johorchingay.com,” said Tan Chai Puan, a cultural activist and co-founder of the art of the 24 Festive Drums. Tan, an associate editor of the book along with Lim Kong Yong and Koh Lian Lee, was proud that the association was able to assemble a number of Johor talents and sponsors to participate in a host of activities organised for this year’s Chingay festival. Since the Johor Chingay was documented by various Asian television broadcasting companies, Tan discovered that China’s Phoenix television station had produced several videos of the Johor Chingay parade that are available for viewing on the YouTube channel. He said these videos, which showed some of China’s top scholars discussing the cultural value of the Johor Chingay, reminded him of the importance of Johor’s annual tradition to the Chinese not only in our local community but also to a global audience. 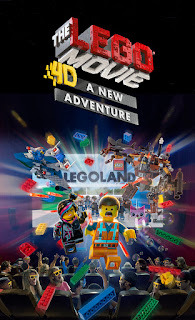 “The Lego Movie 4D: A New Adventure” was recently launched at Legoland Malaysia Resort by Malaysian Tourism Promotion Board director-general, Datuk Seri Mirza Mohammad Taiyab. Fans of “The Lego Movie” were invited to find out what happens after the end of the blockbuster movie in the debut screening of this new episode at the Lego Studio theatre. Emmet, Wyldstyle, Unikitty, Metal Beard and Benny reunite in this episode to thwart a shady character named, Risky Business, who has an evil plot to open a theme park bearing a suspicious resemblance to Legoland. 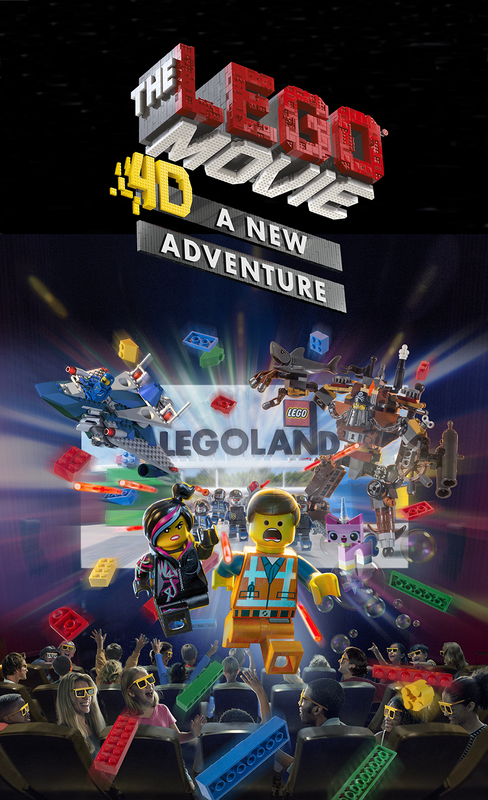 "We are proud that “The Lego Movie 4D: A New Adventure” has joined our stable of attractions in Legoland Malaysia Resort as a permanent feature in the Lego Studio,” said the resort’s director of operations, Casper Bonavent. The movie launch was also an opportunity for Legoland Malaysia Resort to announce that the park recently clinched the Best Tourist Attraction award in the Man-Made Attraction category of the Malaysia Tourism Awards 2014/2015. “I’m so proud to be part of the team that has been working with Legoland Malaysia Resort since its doors first opened in 2012 as this award pays tribute to all the Park’s Model Citizens who have worked tirelessly to ensure that we are the best family holiday destination,” said park general manager, Mark Germyn. “We will keep on giving our best to ensure that all our guests have the most memorable experience while supporting Tourism Malaysia to contribute to its success in every way possible,” he added. To celebrate this proud achievement and the exciting new attraction, the park is exclusively offering the people of Johor a Buy 1 Adult ticket to get 1 Child ticket free, deal throughout March and April. Others may take advantage of the Buy 1 ticket and get the second ticket at half price offer available on the website. Legoland Malaysia Resort is fully committed to adding new attractions to the park every year, among them the highly acclaimed Water Park and Legoland Hotel, the Star Wars Miniland and the Ninjago: Realm of Shadows live show, with an exciting ride – the park’s biggest investment to date – scheduled to open later this year. "We encourage every tourist attraction here to increase and improve their products to keep themselves competitive and attractive to tourists and local visitors,” said Mirza who added that the ministry is also looking into facilitating a smoother entry into the country for tourists who are arriving mainly from Singapore, Indonesia and China. Also present at the event were the park’s director of sales & marketing, Thila Munusamy, JB Central Municipal Council president, Dr Badrul Hisham Kassim and the teams from Tourism Malaysia and Legoland Malaysia Resort. I often learn about new restaurants in the city through word-of-mouth and when I hear rave reviews about Sprout from two different sources on the same day, I know it’s time for my own dining experience. At Sprout, I meet Chef Mui, 25, a Hakka who hails from Kulai, who is earning a reputation for his menu of sophisticated food created from wild-caught fish and locally farmed meat and vegetables. He is always finding new and creative ways to cook local produce and the menu will often change, depending on what ingredients he can source fresh from the farm or sea. Listening to the passion in his voice, I’m impressed with his concept of sustainable eating right here in Johor Baru, where the freshest ingredients can be sourced from farms in Kempas, Kulai and Cameron Highlands and the seas off Pontian and Mersing. It didn’t take long for me to pick my choices for an elegant 3-course set meal with Snacks on-the-house and I sit back, waiting to be wowed. There’s something brave and resolute about Mui and his culinary team of Joseph Teoh and Wenny Lee, who opened this unpretentious little restaurant for modern European food in JB’s oldest residential area. I guess it’s probably to keep overhead costs low so that they can focus on creating a delightful dining experience for discerning diners. Who would have thought that our humble pumpkin can be turned into a tasty and interesting snack? A slice of toasted pumpkin topped with bacon jam is certainly an appetizer that signals more exciting dishes to follow. As I admire the pretty plating of my Quinoa Salad (RM27), I know a great deal of thought went into creating the balance of textures and tastes with fresh and cured ingredients. Before I dig in, I look closer at the compressed and pickled cucumber sitting on a bed of quinoa with a side of broccoli puree and confit tomatoes, drizzled with sourdough crumble and fermented melon dressing. Then I take my time to enjoy the nice crunch of the tasty quinoa that perfectly complements the tangy taste of the fresh and preserved vegetables. I watch as cold cucumber gazpacho is being drizzled on the warm vegetables of the Asparagus Salad (RM27) served at the table and learn that it’s an interesting mix of warm and cold. Slivers of asparagus and baby gem leaves tastes refreshing with dollops of an odd blend of walnut jam and salted egg yolk! While fans of fine dining may expect a menu of air-flown or exotic ingredients, Chef Mui is educating diners on new ways to appreciate local fresh produce. My Garoupa (RM50) choice from the Sea menu is an exciting dish he created using garoupa and squid from Pontian and micro vegetables from Kempas. The tasty texture of fresh fish topped with black olive crumbs complements the side of squid confit and cauliflower couscous along with bouillabaisse sauce – a rich foam created from fish, chicken and shellfish stock. The Pork Belly (RM42) from the Land menu, made up of two types of meat – belly and trotter – changed my mind about what these should look like. The hours of preparation that went into making the crispy coated confit of meats did not disappoint because I can taste its distinct gelatinous goodness in each mouthful. The rich meat flavours are balanced by sour apple, mustard aioli, radish and charred spring onion, topped with a crunchy slice of crackling! The cosy restaurant that seats up to 20 guests includes a row of seats at the bar where casual diners can watch as the chefs prepare and plate their meals. While space is limited in the kitchen, Mui and his team move around with dexterity, much like bats with built-in sensors as they exchange places between the oven, stove and various spots along the narrow path. As each dish is served, Mui or Teoh will describe the ingredients and its preparation, if it was a confit, tartare, infused, cured, fermented or foamed, and may even suggest how I can start savouring the exquisite composition for the best effect on my palate. For instance, Mui suggests that I nibble the candied mint leaves followed by a lick of lemon gel before tasting the smooth Chocolate mousse (RM27) with a side of mint sorbet and cookie crumbles. Another popular dessert choice here is the Banana (RM25) with olive oil sponge, sesame paste and lime yoghurt. The attention to detail, not only in food preparation and plating but also in personably presenting it to diners, is something that simply distinguishes Sprout from others. Drive down Jalan Tebrau towards the city, keeping left as you near Kim Teng Park residential area; Slow down to find Sprout in the first unit of the only row of shops parallel to the road. From starters, salads, mains to desserts – all are must-try items! English-speaking staff who will describe your food in exquisite detail! While Chap Goh Meh, the 15th day of the Chinese New Year marks the end of the festival, the celebration in Johor is not over until the Johor Chingay festival has taken place on the 20th day of the first lunar month. History will be made this year when the Johor Sultan, His Royal Highness Sultan Ibrahim Almarhum Sultan Iskandar, joins the rakyat for the Chingay parade. The sultan is no stranger to the Johor Chingay, having witnessed the event in 2006 when he was still the Crown Prince. “It is especially meaningful for the Johor Chinese community because this will be the first time for a Johor Sultan to grace the Johor Chingay,” said JB Tiong Hua Association chairman, Datuk Seri Tey Kim Chai. Tey echoed the sentiment of fellow community leaders when he expressed his pride in Sultan Ibrahim who respects other cultures and promotes unity in a multi-racial community. Organised by the Johor Baru Tiong Hua Association, the Johor Gu Miao or Old Temple, has kept the annual Johor Chingay tradition since the 19th century without interruption except once during the Japanese invasion in 1942. The highlight of this festival is the street parade scheduled on the evening of the 21st day of the first lunar month, which coincides with February 28 this year. The city will be at a virtual standstill when roads are closed for the street parade and the whole community will line the streets to watch skillful performances by prancing lions and dancing dragons, to the thunderous beat of drums and gongs. A grandstand will be set up outside KOMTAR JBCC for the Sultan and other special guests to watch the parade when it keeps its traditional route and passes through Jalan Wong Ah Fook. The festival originated as a religious tradition of the Johor Old Temple, where the temple deities are taken on an annual “tour” to bless the city with peace and harmony, good weather for the cultivation of gambier and to celebrate good harvests. Unlike other Chinese temples that usually bear the name of the deity to which they are dedicated, the temple is believed to be the first Chinese temple in the nation to be named after a State. In Malay, the temple is known as Kuil Kuno Johor. The strong relationship between the Johor ruler and the Chinese immigrant community was the reason “Johor” was incorporated in the temple’s name. Built in the 19th century by a group of Chinese community leaders led by Tan Hiok Nee, then leader of the Johor Ngee Heng kongsi or society, it was dubbed the Temple of Unity because it uniquely houses the deities worshipped by the five main Chinese dialect groups under one roof. The street parade, which started as a religious celebration for the five deities, Zhao Da Yuan Shuai (Hainanese), Hua Guang Da Di (Cantonese), Gan Tian Da Di (Hakka), Hong Xian Da Di (Hokkien) and Yuan Tian Shang Di (Teochew), has since evolved into a cultural carnival and an award-winning tourist attraction. The celebration starts with a lighting ceremony at Xing Gong, a temporary shrine at Jalan Ulu Ayer Molek, followed by a cleansing ceremony at the Johor Old Temple before the deities leave for their 3-day outing, with the street parade as the peak of the Chingay festival. In the weeks while our family was together, we went through dad’s things to sort out what were still useful and which items to keep or give away. Dad has given us a lifetime of shared experiences and each item we looked at brought back a flood of fond memories. It was bittersweet to see dad’s familiar handwriting and discover how he carefully stored what was important to him. Besides old receipts that date back to the 1970s and user manuals for appliances that were no longer in use, we made a few exciting discoveries. Mum opened dad’s nightstand to sort through his things and we saw a few books, old cassette tapes and knick-knacks. She sorted through old documents, mementoes and photos and we saw some of dad’s black-and-white passport photos that were taken at different ages. These were mandatory shots snapped professionally at photo studios and kept so well that we could see the details quite clearly, even as his hair was thinning and greying at the temples. but filled with his handwritten notes! Looking at such nostalgic mementoes had its lighter moments especially when my sisters and I couldn’t help laughing at the sight of mum’s bee-hive hairdo in a photo from way back when it was fashionable to back-comb hair and set it into a huge helmet! From the locker next to dad’s favourite chair, I found a few pairs of dad’s old spectacles as well as his Ray Ban shades among separate files for water and electricity bills, word puzzle books and recent magazines. While most of the old magazines would go to the paper recycle bin, one old exercise book is a precious memento that I would like to keep. Dad had recycled this exercise book for his own use and the subject title on the cover originally written as, “Lectures on Infectious Diseases,” had lines drawn over it and another title written above was: “Jokes, Humours & Quotations.” The date written under his name was 3.7.48 – 3 July 1948 – a date long before he met mum, and he even learnt to write his name in Chinese characters at the left side of the cover! Because of a dark stain on the side of the cover, it looked like dad used a fountain pen to copy quotable quotes, jokes and funny definitions into this exercise book. I was engrossed in reading page after page of his scrawl and couldn’t help feeling touched and tickled at some of the words and phrases that dad thought was useful or funny enough to keep for his own reference. I guess in those days, young men like dad would be writing to young ladies and these words and phrases may be used to impress or amuse them. Yes, back then there was an art to writing cards and letters. In modern times, these words may be readily available online but in those days, I think if dad came across a cute or cheeky phrase in newspapers or magazines, he had to copy them down for future reference! Among his personal things, mum also discovered a stash of cash that dad had squirreled away. But what was more exciting was a collection of currency known as banana notes that was used during the Japanese Occupation of Malaya. Dad told us about how he had to learn to sing the Japanese national anthem and bow to the fierce Japanese officers whenever he met them. It was an era when he picked up a smattering of Japanese language and he enjoyed teaching us common greetings and phrases. While going through dad’s wardrobe, we saw how dad had organized his handkerchiefs in a little box and there were even a number of brand new unopened packs of handkerchiefs, underwear and singlets. As mum sorted through which clothes to give away or dump, my brother and his family could not resist wearing dad’s favourite home shorts and posing for a photo in his memory! We also discovered over half a dozen brand new Panasonic electric shavers that I had bought for dad over some time because he always insisted on having the same old model. To avoid failing to find the same model, I usually bought a few to keep on standby so that whenever he asked to replace his old shaver, I would have one of the same model ready for him. I must have forgotten where I kept the new shavers and bought more each time I came across the same model and so there were seven in stock! From our bookcase, I uncovered a wide collection of dad’s books on theology and noticed his particular interest in topics like cults and isms, eschatology and current world developments that are fulfilling Bible prophecy. Many of these topics are now available from an online Google search but dad was already studying this from books and magazines in an era when the internet was still uncommon in this part of the world. From dad’s collection of books and magazines, the topics and genre that interested him was obvious. While dad read widely, his interest was in non-fiction, true-crime and war stories. My sisters and I used to buy him books from this genre while we were abroad but we stopped doing so a few years ago because dad’s eyesight was deteriorating and he could no longer read that font size of the print in most books. Pages from dad's binder filled with war magazines! In earlier years while he could still read the standard font size of newspapers, magazines and books, dad did not limit himself to his usual choice of subjects but often read books from my collection. I noted this from a pocket-size index book that dad kept to record the book titles that he had read, probably because he could not remember all the titles and needed the easy reference to remind him of books which he had already read! Meanwhile, dad's subscribed magazines are still arriving by post and I have written to request them to discontinue sending the magazines. In the store room, I discovered that dad had stored away his old collection of war magazines that was accumulated from a subscription for “Images of War, the Real Story of World War II” which was my gift to him. at the top with two more of Lat cartoons! Besides a box full of magazines, there was also a binder filled with a series of full-colour magazines. Dad lived through the war and that was probably why he was keen on reading true accounts of what had happened in other parts of the world during the war. In those non-internet days, book and magazine subscriptions such as this provided accurate accounts and good photos of any particular topic of interest. In another box, I discovered three thick record books which dad had kept individually inside the protective cover of plastic bags. When I spotted the word, LAT, pasted on the cover of one book, I recalled that the first of these was a scrap book that dad started ages before I was born! Dad had such a wacky sense of humour that he even had a hobby in collecting cut-outs of cartoons from newspapers and magazines and pasted them into these scrap books. I hardly know some of the cartoon characters in the first book because they were published way before my time and the only ones I recognised were Nancy and Sluggo and Blondie and Dagwood.tly recalled ecordd thick record books that dad kept inside the protective cover of plastic bagsteaching us greetings and phrasesnever I realise that I first started to enjoy the scrap book by colouring in the black-and-white cartoon strips with my Neo-Magic pens! Old bill for cotton mattress ordered for me! But I clearly remember the next two scrap books that were filled with newspaper cut-outs of Lat cartoons. In those days when the cartoon was published weekly, we often picked up the newspaper and found a hole on the page because someone – likely to be dad – had cut out the cartoon! I used to help dad paste the Lat cartoon cut-outs on the scrap books and my siblings and I used to enjoy hours poring over the pages, laughing at how clever Lat was at observing those Scenes of Malaysian Life. Lat cartoons were a family favourite and when collections of vthese cartoons were pvublished in a series of books, we bought them for dad. But I guess our scrap books of Lat cartoonsv may be a wider collection than those published in books because we diligently collected the cut-outs from the weekly newspapers for years. The newsprint may be yellowed and the edges of the cut-outs dog-eared from being flipped about so often but I think we are going to have many more hours of reminiscing pleasure when we go through those books again. Check out the letter to editor I wrote in 1979! When I turned to the back of the scrap book, I discovered that dad had pasted his picks of newspaper cut-outs of interesting news articles. Among the reports published about family members, there were some of my articles and letters to the editor in the New Straits Times and Malay Mail. I must admit that I had forgotten about ever having written them but seeing them again in dad’s scrap book was like opening a floodgate of memories. Dad was notorious for cutting out news articles without headlines, dates and names of the publication but on one page where he pasted a photo story on our Aunty Sylvia on her return from the Commonwealth Games in Edmonton, my eyes were riveted to a small cut-out pasted next to it. Dad had scribbled my name and date, 21/8/1979, on that piece I had written under the pseudonym, Dog Lover. This to me, is a precious memento of how dad was encouraging me to write even back then in the 70s. While I was in the UK a couple of years ago, I found key-ring souvenirs for mum and dad embossed with words which aptly voiced my thoughts. While mum is still using that key-ring with her set of keys, I’ve claimed back the one I gave to dad to use with my keys. The inscription on the leather tag reads: “My Dad – Throughout my life you have been there with the love and support that comforts me each and every day.” Dad, you know that I always treasured your quiet pride in my achievements, no matter how small. Thanks, D! The Rotary Club of Johor Baru (RCJB) which has been providing highly subsidised treatments for hundreds of patients at their haemodialysis centre in Johor Baru, plans to set up their second centre in Bandar Seri Alam this year. It will be located in a 4-storey shop lot in the Fortuna Hub Premier Shop Office precinct of Bandar Seri Alam and is a contribution from the family of the late Ng Quee Nam, founder of Chee Tat Plantations which was developed into the modern township of Bandar Seri Alam. In 1989, Rotarians of the RCJB were encouraged by the late Sultan Iskandar Almarhum Sultan Ismail, previous Sultan of Johor, to establish large scale projects that truly make a difference to the community in the long term. 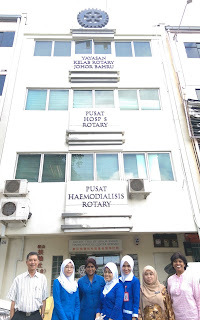 This spurred the Rotarians to set up their first haemodialysis centre at Wisma Abad in 1992, a project which expanded to a 4-storey shoplot at Jalan Tun Abdul Razak and was officially declared open by Sultan Iskandar in 2004. For more than 20 years, this pilot haemodialysis project by the RCJB has been benefiting patients and its success has inspired other Rotary Clubs in Johor to set up similar centers to support hundreds of patients in JB, Kulai, Pontian, Kota Tinggi, Kluang, Mersing and Batu Pahat. As the community grows, the need to provide affordable haemodialysis treatment has also grown and the queues of patients in need of treatment keeps getting longer. This growing need demands a response and RCJB President 2015 – 2016, Freddie Lee, mooted the idea to set up a second haemodialysis centre to serve the needs of patients in the area around Masai and Pasir Gudang. "We expect to start renovations in the first quarter of 2016 when we have obtained the necessary licenses and approvals from the relevant authorities,” said Lee. The estimated costs involved for building renovation, dialysis machines, a reverse osmosis water purification system and other fittings, is in the region of RM700,000, which the RCJB aims to raise through public donations. To this end, the RCJB is organizing a fund-raising Charity Gala Dinner on March 5, held in the Grand Ballroom of the Amansari Resort Hotel in Bandar Seri Alam and the Johor Menteri Besar, Datuk Seri Mohd Khaled Nordin has been invited as the guest of honour. The public is also invited to partner with the RCJB in raising funds for the new haemodialysis centre by buying dinner tables at the charity dinner in two categories, VIP Tables at RM10,000 and Gold Tables at RM5,000 per table of 10 guests. The names of cash contributors will be permanently acknowledged on a Donors’ Wall in the centre in the form of a Platinum Plate for donations of RM50,000 and above, a Gold Plate for RM20,000 to RM49,999 and a Silver Plate for RM10,000 to RM19,999 donations. To make donations and table reservations, email to: lihui@umland.com.my or Tel: 607 – 3881111. All donations will be acknowledge by official receipts. Johor Area Rehabilitation Organisation (JARO) committee and staff members, volunteers and well-wishers enjoyed a sumptuous lunch treat at the New York Hotel Johor Baru recently to celebrate Chinese New Year. Founded in 1952 as a rehabilitation centre for TB patients, JARO has evolved into an established charity with a sheltered workshop where people with disability are trained and employed in the book-binding, basketry and tailoring sections. Their products are sold in a gift shop run by JARO. JARO is proud that their book-binding section continues to receive job orders not only from local customers but also from an international clientele who appreciate the fine quality of their work. “JARO has been able to train and provide employment to our disabled staff for the past 64 years through the support of generous donors and sponsors,” said JARO chairman, Datuk Jimmy Low Boon Hong as he expressed his appreciation for their loyal support and generosity. “I hope your support will continue in the coming years and wish to encourage corporations to consider offering employment to people with disability,” he added. He also thanked the hotel management for their kind sponsorship of the Chinese New Year lunch with JARO staff. Low, who has been JARO chairman for more than ten years, leads a committee of socially conscious aprofessionals to manage the charity which also has a gift shop that sells quality handicrafts. Low said Think City, a community-based urban regeneration body and subsidiary of Khazanah Nasional Berhad, was studying JARO so that the sheltered workshop could be upgraded to offer a better working environment to its staff and more employment opportunities to the disabled. Also present at the event were Johor Baru Tiong Hua Association and Chinese clan associations representatives, as well as friends of JARO such as Helen Lim of Fizzio Health, who distributed ang pau or red packets to JARO staff. JARO also received donations of RM1,500 from Holiday Plaza management and RM15,233 raised in a charity event organised by the youth wing of the JB Tiong Hua Association last November.